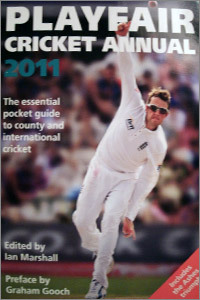 Ian Marshall’s second venture after the untimely death of previous Editor, Bill Frindall, retains the same format as previous editions but with subtle differences and is very much the same excellent reference book that cricket followers are used to. Having known Ian from the days when he opened the bowling for Bill Frindall’s Maltamaniacs, I remember being politely corrected after saying that Bill must have kept him busy. It was the other way round. Ian has kept more or less faithful to the same format and all the sections are included in the concise 335 page annual. Statistics for this summer’s visitors and likely players, statistical records from 2010 Tests and scorecards from all Tests as well as general Test records; county players and records, career statistics and a fixture list. First-Class and LOI records are also very well presented and, due to high demand and even a petition, Minor Counties and Second XI have been restored. Ian reminds readers in his excellently written foreword of the Playfair website and that Playfair is also on Facebook. All in all, Ian Marshall, one of the prestigious few Editors of Playfair, has continued his most worthy work from last year and Playfair remains still the indispensable and very reasonably priced annual for all cricket followers.